ეიასის სურათი NASA World Wind-ისგან. ეიასი (წინა სახელი გერმ. Njarasasee) — სეზონური გაუდინარი მლაშე ტბა სერენგეტიის დაბლობში. ტბა მდებარეობს სერენგეტის ეროვნული პარკის სამხრეთით და ნგორონგოროს სამხრეთ-დასავლეთით. ტბას აქვს წაგრძელებული ფორმა. ↑ Foster, A. and C. Ebinger and E. Mbede and D. Rex (August 1997). 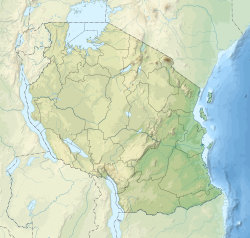 "Tectonic development of the northern Tanzanian sector of the East African Rift System". Journal of the Geological Society 154 (4): 689-100. .
ეს გვერდი ბოლოს დარედაქტირდა: 07:54, 12 სექტემბერი 2016.